This was perhaps the most hit-or-miss journeys I've ever had. 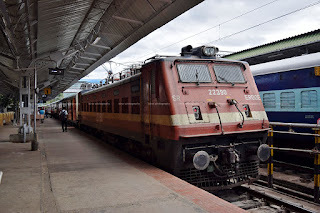 I and my colleague left the venue of the meeting sometime around 1530hrs - we wanted to get the Garib Rath Express to Bengaluru - that was the last train of the day, and should we miss that, we'd end up stuck in Trivandrum for a day. We had to hurry. We hadn't reserved any tickets - but we decided to try the current reservation counter at Trivandrum central. We made it there by around 1545hrs - there was no staff at the counter. The board outside the counter said tickets would be issued upto 30 minutes before departure of train from the origin - our train leaves at 1700hrs. Once the guy at the counter turned up, we put in our application form. We got the seats we asked for - in G15. Another trip to Trivandrum - this time at a very short notice. I was totally unprepared for this one, and actually caught me off guard. 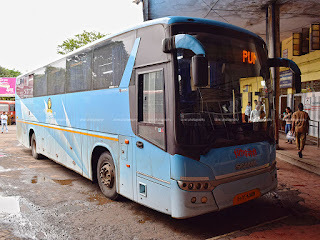 With tension brewing between Karnataka and Tamilnadu, bus services were in a complete mess - even otherwise, buses weren't fitting into my requirement. I had to be in Trivandrum early in the morning, so that I can reach the program that I had to attend, which starts at 10am. The focus turned to trains now - a colleague was to travel with me. We did a quick search on the Indian Railway website - and found that the Yeswantpur-Kochuvei AC Express was operating on that day. 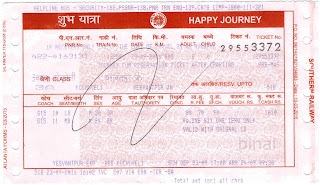 Tickets were booked in AC 3-Tier, through the IRCTC website. The upcoming pooja holidays - three days off together. What more do I need to book a ticket to go home? Flights were ruled out since they were too expensive. Buses were expensive as well. 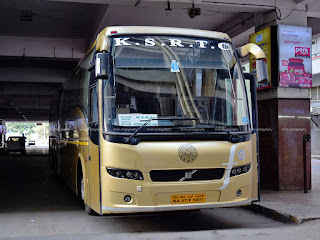 I remembered that Kerala RTC opens reservations as early as 45 days in advance quite late - I casually checked the Kerala RTC website and found that most buses were already full! I did not have much time to waste - I made a reservation on the Ernakulam-Bangalore Garuda King Class - despite booking on September 9 for a journey on October 11, only seats towards the rear were available - and I selected seat #35. For some reason, the fares looked way off to me - it didn't take a lot of time to realise that KSRTC was charging end-to-end fares on all buses that day! Business sense dawns on KSRTC - began with flexi fares, now end-to-end fares during peak days! Way to go KSRTC! Ticket hunting is one thing where I spend a lot of time. The other thing I spend time on is our holiday list. During these process, I came across this long weekend in mid-October - the Dusshera weekend. The holiday calender showed three continuous days of holidays. Flights were already prohibitively expensive, and I booked tickets by bus - over a month in advance. I always have a jinx about early planning - I was scared this time as well. My jinx came true as my office decided to play around the holiday dates. I usually end up losing holidays, but this time, the office decided to give a day additionally off. I had to reschedule my tickets now - the announcement came a little late, and I had not many options now. 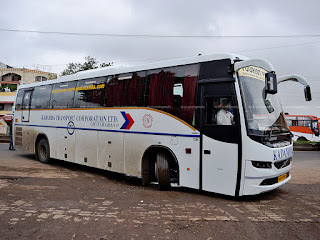 The Karnataka State Road Transport Corporation had some special buses, priced at way beyond what they are worth - but the saviour was the 1501BNGTRC Airavat, via Mysore. Thankfully, seats at the front were available. I didn't have too many requirements. I had to attend the conference, make a quick visit to Shirdi, and fly back home at convenience. I selected the day for my Shirdi visit based on flight availability, and of course, the budget. After a lot of deliberations, considerations and contemplations, I finalised the visit to Shirdi on a Monday. 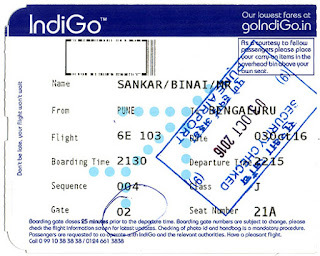 Flights for Monday evening were fairly cheap, and Indigo's new series of late night flights were adding to the convenience. I booked the first of the two late night departure from Pune - this gave me ample time to travel from Shirdi and connect to my flight. I had to go to Shirdi. But I didn't have a ticket! I briefly romanced the idea of taking a train - but then the timings wouldn't work. Then some private operators, but that didn't fit either. I fell back on MSRTC - browsed their website looking at options. Finally, I decided to keep the options open. The conference that I was attending was to go on till about 2pm. I had to factor in the traveling time from the venue, near Chinchwad, to Shivaji nagar bus station as well. With all these in mind, I decided to head to the bus station and then decide. I had done this circuit last year - the Pune-Shirdi circuit. Even not being a religious person, I did feel I must go back to Shirdi once again. I had a great darshan last year - and gave me a lot of peace. Its about time, I repeated. I tried working out this trip multiple times - a lot of plans made and discarded. My turn to go back to baba came soon. I had to attend a conference in Pune - the program was over a weekend. I could make a head out to Shirdi from there as well. Since the conference was spread over the weekend - on a Saturday and a Sunday, I had the choice of visiting Shirdi either on Friday or Monday. A quick look at ticket availability made my decision making easier. I decided to do it on a Monday.